We’re pleased to announce Omar Khouri’s first solo exhibition in London. This new body of paintings and work on paper, titled Glass, explores a solid separation between two disparate worlds Omar has lived in: the Middle East and the West. It represents a dialogue between cultures that see one another but often have difficulty communicating, translated through fragmentation of both physical identity and the mind’s creation of the outside world. 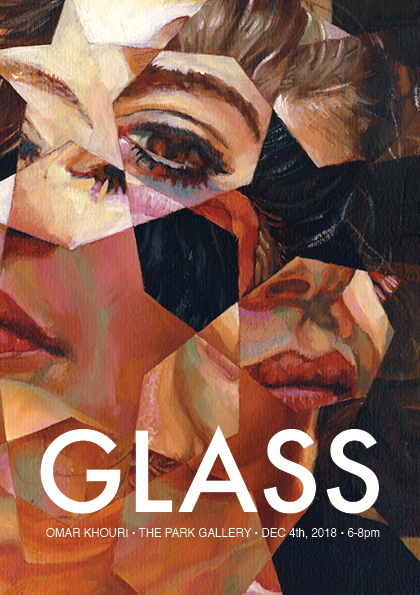 The fragility of life is represented through glass and its cracks, which pose the danger of being able to wound us whilst also providing direction, a path. By abstracting these portraits, there’s a universality that separates and holds us together at the same time: composition patterns of Islamic Geometry – used in everything from floor tiles in homes to the borders of miniature paintings – combined with Western techniques of classical portraiture. A conjunction of East and West, physical and non-physical that invites the viewer to look past individualism to a duality that connects us. Omar Khouri (b. 1978) is part of a new Contemporary Art movement emerging from Lebanon. He is an interdisciplinary artist working with painting, animation and music, amongst other art forms. In 2006, he co-founded Samandal, the first experimental comics magazine in the Middle East credited for starting the recent comic book revolution in the Arab world. His work has been exhibited and is held in collections around the world including Lebanon, the UK, the US, Japan, and across Europe. Recent shows include Exhibitionist (2018), a solo exhibition at La Vitrine, Beirut and Face Value: Portraiture (2018) a group show at Saleh Barakat Gallery, Beirut. He currently lives and works in North Lebanon. Joe Start runs The Park Gallery, a gallery and art advisory established 26 years ago in central London that has a focus on Modern & Contemporary Arab Art. He has a background at the auction house Christie’s, and has curated exhibitions at galleries, fairs and museums internationally. Cedric Bardawil has been exhibiting emerging artists in temporary spaces over the last 6 years, with a focus on the interface of visual art and sound. Of Lebanese origin, he discovered Omar’s work through a music collaboration with Raed Yassin titled Malayeen. *Please note that the gallery will be closed over the Christmas holidays from 20 December and will reopen on 7 January.